Obama advisor Jonathan Gruber, the MIT economist whose name has become synonymous with lying to achieve a liberal public policy goal, has been on the public payroll in Vermont helping liberal interest groups and state officials dismantle the free market in medical services in the Green Mountain State. But thanks to investigative reporting by Breitbart’s Michael Patrick Leahy some Vermont state officials are beginning to ask exactly what they are paying Gruber for – and the answers aren’t pretty. To date, the administration of Governor Peter Shumlin (D-VT) has provided little evidence that it has exercised any accounting oversight of the $280,000 contract it signed with Gruber in July. Nor does it appear eager to provide the documentation Vermont State Auditor Doug Hoffer has requested that would make the contract more transparent to the public. The Vermont State Auditor is a constitutional officer elected every two years. Hoffer, a graduate of Williams College and the University of Buffalo School of Law, was first elected to the office in 2012 and re-elected last month. Under Vermont law, the State Auditor has broad authority to review and audit most aspects of the state government's activities. Leahy reports that Hoffer wants to know who's been paid as part of Gruber's contract. "That's just standard procedure for monitoring any contract," Hoffer told the Vermont Digger when it broke the story on Wednesday. The Vermont Digger reported that Hoffer's request "but was made in response to incomplete documentation of the work being done" by Gruber. The contract calls for Gruber to provide financial and economic modeling assistance to the Shumlin administration as it develops a report on the financial viability of the proposed Green Mountain Care single-payer health care system. Hoffer told Breitbart News that he initiated the request for more information on the details of the Gruber contract, specifically the names, employment status, and contact information for the research assistants Gruber says he is paying $100 per hour to assist him in conducting the work of the contract because "there's a lot of concern in the community for the information that has not yet been provided about this contract." Leahy tells us that under the terms of the contract, the State of the Vermont pays Gruber personally for every invoice billed in the contract, and relies only upon his word that his unnamed, subcontracted research assistants are paid in accordance to the hours specified in the invoices he submits to the state. Last month Lawrence Miller, Vermont's health care reform chief, announced that the amount Gruber was being paid in the contract had been reduced from $450,000 to $280,000. Miller did not, however, present the written amendment required in the contract until two weeks later. That amended was signed by both parties on November 25. "After the first inquiry [from the press], the [Shumlin] administration put the amendment in writing," Hoffer told Breitbart News. However, Hoffer noted that "they had not yet as of earlier this week provided the billing documentation [for the Gruber contact]." Consequently, Hoffer told Breitbart, he sent a request for that documentation to the Shumlin administration by email on Monday. "They called me back the same day and said we'll get back to you in a few days, but we're dealing with a number of other requests right now for public documents," Hoffer added. "They will let me know if they have the information. It's probably likely that they don't have this information. I would hope that they will ask Gruber for it," Hoffer stated. "If they provide that information [on employment status, names, and contact information for Gruber's research assistant] the rest of the information will be obtainable," Hoffer said to Leahy. Hoffer confirmed that he will be looking for evidence to confirm that payments have been made to Gruber's research assistants by Gruber in accordance with how he billed for their services in invoices submitted to the state of Vermont. In September, Gruber billed Vermont $50,000 for 500 hours of work by his research assistants, which he billed at $100 per hour. 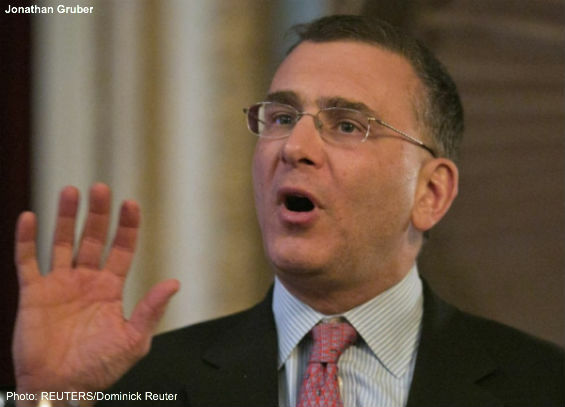 In October, Gruber billed an additional $50,000 for 500 more hours of research assistant work. Under the revised terms of the contract, Gruber will bill Vermont an additional $100,000 for 1,000 hours of research assistant work billed at $100 per hour. "The more important question," Hoffer told Breitbart News, "is the substance of the deliverable." WCAX television in Burlington, Vermont reported on Wednesday that the administration of Governor Peter Shumlin (D-VT) continues to withhold information about the financial details surrounding the state's contract with controversial MIT economist Jonathan Gruber. WCAX confirmed Breitbart's earlier reporting, when it found that "Vermont recently amended its contract with Gruber for his work projecting how that planned transition would affect the state economy. Gruber will no longer be paid $500 an hour for his time, but he may still be cashing in on the $100 an hour he bills for graduate assistants' time." Suprisingly, WCAX was unable to obtain much information about the details of Gruber's contract with the state from Governor Shumlin. In an embarrassing admission, the Shumlin administration said it was exercising no financial control over the administration of Gruber's contract. "MIT'S website does list stipend levels for grad students in science and engineering fields, and indicates students in other fields should be similarly compensated," the station added. "At the high end of the range, those students receive about $20 an hour." As Breitbart reported previously, all checks issued in compliance with the $280,000 personal services contract Gruber has with the state of Vermont are issued to him personally. The state is not requiring any accounting documentation that future payments they make to Gruber are then paid directly to his graduate students working at the $100 rate he's billing the state. In essence, the state is giving Gruber blank checks to spend as he wishes and is relying entirely upon his word that he's paying his assistants as he claims in his contract. According to WCAX, "Gruber declined multiple requests for comment." Informed observers are now beginning to ask if the alleged “graduate student assistants” even exist or if Gruber is once again relying on the assumed stupidity of the American voter to fleece Vermont's taxpayers while destroying their State’s free market in health care in the process.